Affordable Spas & Hot Tubs Inc. 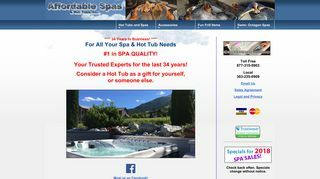 Affordable Spas & Hot Tubs Inc. – Spas, swim spas, chemicals, equipment, accessories and gazebos. – Spas, swim spas, chemicals, equipment, accessories and gazebos.